These previous clients reached back out to Novare when they decided they were ready for an upstairs renovation. The upper level of their home was outdated and wasn’t congruent with the newly renovated main floor we had previously remodeled. The primary areas of focus were the master bathroom and the main bathroom. Master Bath Challenges: In the master bedroom, there was a door to enter the bathroom as well as a separate door to enter the walk-in closet. This was an issue for the two homeowners since they get up at different times in the morning. There was a lot of in and out of the bedroom space to access these two areas. The bathroom also housed an oversized jacuzzi tub that was never used along with an undersized fiberglass shower. Double sinks in the single vanity bred clutter and lack of organization. There was also no room for the homeowner’s beloved Keurig coffee maker. The toilet area lacked privacy and there were large, oddly placed windows that added to this as well. Master Bath Solutions: We relocated the entrance from the master bedroom to the bathroom to create space for a “his” and “her” vanity configuration. This also allowed the clients to now have access to their walk-in closet directly from the bathroom. Eliminating the jacuzzi tub enabled us to reallocate space for a large zero clearance tile shower. We customized built in cabinetry to accommodate linen storage, a pull out hamper and a Keurig station. The toilet was kept in its existing location, except now it is housed in its own water closet. Finally, to address the window issue, we installed three new awning windows. Doing this allowed for an updated front facade, additional privacy from the outside and better wall space/storage in the walk-in closet. Main Bath Challenges: The main bath was original to this 1990’s home and was complete with pink tile and pink laminate countertops. Main Bath Solutions: The layout did not change; however we updated every component of this main bath so that is comfortable for all guests. 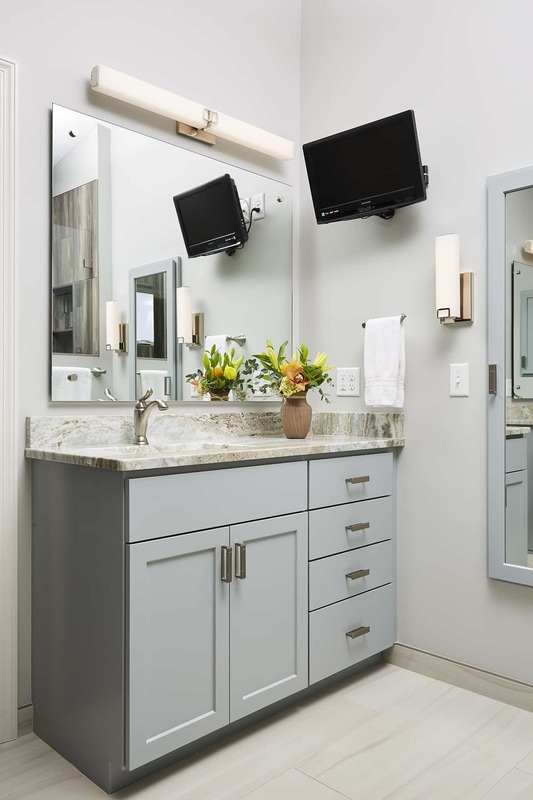 We also increased the vanity storage so that guests have plenty of room for their toiletries. Remaining Upper Level Challenges: Popcorn could be found on all of the ceilings, the carpet was worn and brass light fixtures adorned the second level. Remaining Upper Level Solutions: We removed the popcorn ceilings and applied a knockdown texture. The flooring was replaced with luxury vinyl planking and tile. Lastly, all of the rooms were repainted and every light fixture was updated. Interlachen Woods Outcome: These homeowners are thrilled with Novare’s renovation of their second level. The changes to the master bath will allow this couple to “age in place” in their beloved home. The upper level now compliments the main level and this 1990’s home feels new once again!